Marshmallows are a sweet treat that many of us enjoy with hot chocolate, on top of sweet potatoes, or even shaped into peeps at Easter time. But these fluffy white puffs aren't very healthy. Marshmallow ingredients usually include just sugar, corn syrup, and gelatin. Even so, marshmallow calories can add up quickly if you eat more than a single serving. A single serving of marshmallows is about 28 grams—that's four large marshmallows or just over a half cup of mini-marshmallows. There are about 90 calories in marshmallows if you consume a single serving of the basic form of the food. But there are different types of marshmallow foods and the calories in those foods can vary. 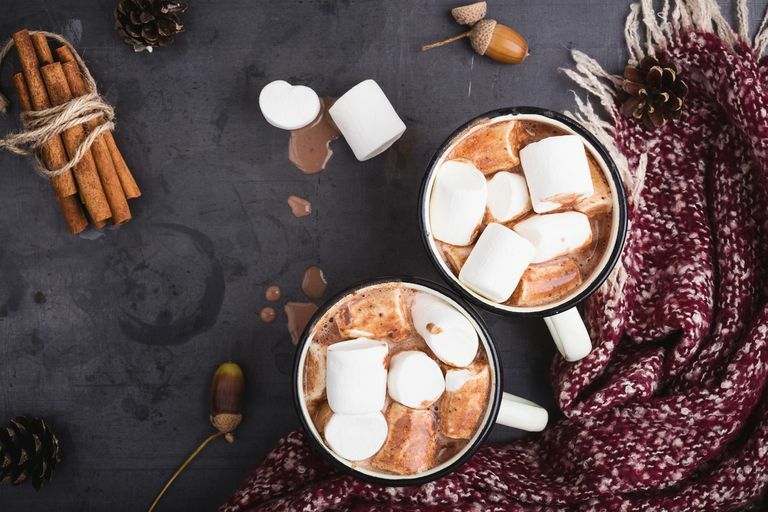 Since marshmallows are made out of different types of sugar (usually sucrose and corn syrup), most of the calories in marshmallows come from carbohydrates. One marshmallow contains just under 6 grams of carbohydrate. A single serving of marshmallows provides about 23 grams of carbohydrate, primarily in the form of added sugar. The glycemic index of marshmallows is estimated to be about 62, making it a high glycemic food. But the estimated glycemic load of a marshmallow is just 15, which is fairly low. Glycemic load takes serving size into account. Because the serving size of marshmallows is quite small, the glycemic load is lower than you might expect. There is very little fat (less than 1 gram) in a single serving of marshmallows. Marshmallows are not a good source of protein. There is less than 1 gram of protein in a single serving of the treat. As you might expect, you won't boost your vitamin or mineral intake by consuming marshmallows. However, a single serving of the food does contain a small amount of phosphorus (2.2 milligrams) and potassium (1.4 milligrams). It also boosts your sodium intake (22.4 mg) and provides a very small amount of selenium (0.5 mcg). Marshmallows are a processed food that provides little to no health benefits. However, there are ways to include marshmallows in a healthy diet. For example, marshmallows are a low-calorie, nearly fat-free food. If you are watching your weight, eating a marshmallow is a quick and easy way to satisfy your sweet tooth that won't do too much damage to your waistline. In addition, adding marshmallows to certain foods might help you to boost your intake of healthy vegetables. For this reason, many savvy Thanksgiving cooks add marshmallows to sweet potatoes. Lastly, marshmallows are almost always a gluten-free food. So if you are gluten-intolerant, this is probably a safe food to consume. Do marshmallows ever go bad? Marshmallows have a long shelf life, but they don't last forever. You generally won't find an expiration date on the package, but rather a "best by" date. If you don't open your bag of marshmallows, they can last up to six or eight months. If you open the bag, marshmallows last four months or less. What's the best way to store marshmallows? Some marshmallows can be purchased in an airtight tin and can be stored that way. But most often you'll buy marshmallows in a plastic bag that is not resealable. In that case, you'll want to transfer the marshmallows to an airtight plastic container or seal the bag tightly after opening. Marshmallows do not need to be refrigerated. Can you freeze a marshmallow? Many cooks freeze marshmallows to make them last longer. You can freeze an unopened bag, but the cubes may stick together. To prevent sticking, dust with powdered sugar and place the marshmallows in an airtight container. When you thaw frozen marshmallows, they regain their fluffy texture. There are a few fun ways to prepare marshmallows to help boost your intake of more healthy foods. If you have kids at home, this might be a fun way to include fruits and vegetables in their diet. Consider making Toasty Marshmallow Sweet Potato Skins to celebrate in the fall or use marshmallows to make Open-Faced Apple S’mores, a lower calorie alternative to the traditional treat. Marshmallow allergies are very rare. But if you have an allergy to gelatin, you may want to avoid marshmallows since gelatin is a primary ingredient in almost all prepared and homemade versions. According to the American College of Allergy, Asthma, and Immunology, "Gelatin reactions can cause hives, swelling, itchiness, shortness of breath and a severe life-threatening reaction known as anaphylaxis." If you have a reaction after consuming marshmallows, seek medical advice and treatment.